It is only over the recent years that earbuds are becoming an imperative accessory, provided with growing penetration of smartphones. From initial designs of corded versions, earbuds have evolved into myriad shapes and sizes, meanwhile being incorporated with various functions. The market for earbuds is constantly growing and shifting, witnessing innovations such as the wireless Bluetooth earbuds. Present hype prevailing in the earbuds industry is not a vogue, but the industry’s future. Proliferation in adoption can be ascribed to soaring number of people who are constantly tethered to smart devices including tablets, mobile phones and music players for significant duration of their days, mainly for watching videos, listening music, or playing games. In addition, several individuals are observed walking around with earbuds listening to music, even while driving. Nowadays, majority of the earbuds users seek trendy and fashionable products. And the trend that has gained immense momentum worldwide is inclination toward wireless earbuds integrated with Bluetooth connectivity. These earbuds have been improving in all facets, such as battery backup, since the recent past, becoming competitive in all possible ways with their wired counterparts. Improvements and innovations in earbuds are less likely to slow down in the upcoming years, with manufacturers tirelessly putting efforts in the development of Bluetooth earbuds with longer lifespan, better sound quality and affordable. Several companies are introducing wireless earbuds to the market, with each product having unique features in addition to audio, such as fitness and health monitoring, processing ambient sound for better clarity, and microphones for handsfree calls. 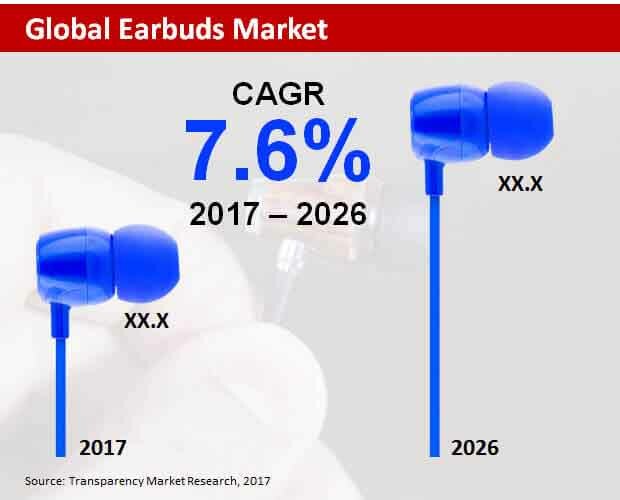 According to a new Transparency Market Research report, the global market for earbuds is slated to ride on a splendid CAGR between the period 2017 and 2026. Worldwide sales of earbuds are forecast to bring in roughly US$ 19,000 Mn in revenues by 2026-end. Asia-Pacific excluding Japan (APEJ) will continue to be the fast-expanding market for earbuds, mainly driven by rising purchasing power of people and their growing interests in earbuds having new and more features. Proliferated adoption rates across offices and gyms will further contribute to the market growth in APEJ. In terms of revenues North America will remain the largest market for earbuds, followed by Europe. Pre-established market along with robust penetration of technologies are expected influence development and demand for earbuds in these regions. Key benefits of in-ear earbuds such as relatively more enhanced sound quality, better noise cancellation effects and less strain on ears on the back of their comparatively lower weight have increased their penetration in the market. In-ear earbuds will remain the most lucrative products in the market, and their sales are expected to reflect the highest CAGR through 2026. Multi-branded stores offer individuals with various options to select from when it comes to buying smartphone accessories such as earbuds. In addition, these stores provide consumers with various discounts on products, which further varies with respect to brands, in a bid to boost their sales. Based on distribution channels, multi-branded stores will therefore remain preferred among consumers who seek purchasing earbuds. However sales of earbuds in online stores will ride on a relatively higher CAGR through 2026. Android smartphones have witnessed immense penetration across the globe on the back of their cost-effectiveness and novel features being incorporated by brands to attract more consumers. Therefore earbuds compatible with Android user operating system are witnessing robust demand. Revenues from Android-compatible earbuds will exhibit a comparatively higher CAGR than those from iOS-compatible earbuds through 2026. Leading players in the market are working in tandem with consumer demand such as the requirement for earbuds that manage striking balance between performance and price. The market for earbuds is increasingly competitive and highly fragmented, with new brands emerging around all price categories. According to TMR’s report, key companies underpinning growth of the earbuds market globally include Apple Inc. (Beats Electronics), Bose, Sennheiser Sony, LG Electronics Inc., Yamaha, Philips, KOSS, DENON, Jabra, Samsung, JBL, and Panasonic. The global earbuds market is characterized by demands innovation and intense competition, along with manufacturers laying an extra emphasis on constant exploration of wireless connectivity, improved noise-cancelling functionality, and provision of feature-oriented products that enable faster penetration into the market. Demand for earbuds has been continuously witnessing shifts and expansion, with a wide variety of designs and features being incorporated by manufacturers. Consumers across the globe demand for earbuds that are capable of managing the strike between performance and price, which in turn has become a key strategy among earbuds manufacturers. Innovations and improvements in earbuds are not likely to slow down in the near future, with the advent of wireless Bluetooth earbuds gaining immense traction among consumers globally. Transparency Market Research has composed a new all-inclusive research report on the global earbuds market. The report engulfs present market scenario, and imparts future prospects of the global earbuds market for the forecast period - 2017 to 2026. This comprehensive research report also encompasses key drivers, obstacles, trends and opportunities affecting rise of the global earbuds market. An overall picture of global earbuds market has been delivered by the report, in order to aid businesses that seek opportunities to make investments in the market. The report delivers an exhaustive synopsis of global earbuds market, with its first chapter titled “executive summary” that elucidates key nodes influencing the market growth. This chapter also illuminates influences that the market dynamics are likely to have on its growth in the forecast period. The report also submits figures related to CAGRs from historical as well as forecast point of view. A chapter titled “overview” in the report follows the executive summary, providing a clear picture of earbuds market’s scope to readers of the report. The overview imparts a concise market introduction trailed by the definition of “earbuds”. Chapters succeeding the overview elaborate imperative dynamics such as growth drivers, limitations and prospects observed in the market throughout the forecast period. These chapters also inundate in-depth insights associated with the global economy, bottom line of enterprises, and fiscal stimulus. A segmentation analysis delivered in the report submits insights on the global market for earbuds. The market is characterized based on product type, distribution channel, user operating system, and region. Analyses on the Y-o-Y growth comparison, market share comparison, and the revenue comparison in accordance with relevant market numbers has been delivered in this chapter. The global market for earbuds has been divided regionally into Asia-Pacific excluding Japan, Europe, Middle East & Africa, Japan, Latin America, and North America. This analytical research study on the global market for earbuds is a complete package, including intelligence on active players underpinning the market growth. In this last chapter, which elucidates the market’s current and future competitive scenario, strategies being implemented by the players, along with information on their product overview, company overview, key developments, key financials, and SWOT analysis is rendered exhaustively by the report. Additionally, region-wide reach of these market players, future expansion plans, revenues, mergers & acquisition activities, and market shares have been elaborated in detail in this chapter. An intensity map employed in the report profiles the market players that are located across geographies. Credibility of researched statistics & data has been backed by a unique research methodology utilized by TMR’s analysts, for ensuring higher accuracy. This research report on global earbuds market will assist its readers to gain detailed insights about many different aspects guiding the market across the regional segments comprised in the report. Readers of this report can further slate effective strategies for foraying the vital revenue pockets as well as gaining benefits over intensifying market competition. Information issued in the report is scrutinized as well as monitored by TMR’s industry experts. The figures and numbers that are offered in this report have been validated by analysts for facilitating the report readers in making strategic decisions.